Travel and outdoor gear company introduces highly versatile collection of packable bags designed with both consumers and retailers in mind. The packable backpack, slash pack, and duffel bag. “Travelers want to save space but still be prepared, and our new line of packables allows them to do just that,” said Derek Crenshaw, Senior Product Designer. The new packables from Lewis N. Clark have been designed to meet the needs of both retailers and consumers. Each packable bag folds down into a neoprene zippered gear pouch, which can be used to store the bag when it is not in use or as additional storage for cell phones and small essentials. For retailers, the gear pouch provides minimal packaging while clearly identifying the product inside, and the collection’s complementary shapes and sizes mix and match for specific merchandising needs. These planogram-ready pouches enable retailers to fully economize retail space. 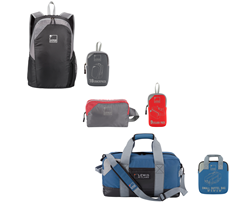 The collection provides a multitude of options for travelers and adventurers, and includes a backpack, day pack (does not fold into pouch), slash pack, duffel and tote. Constructed of lightweight, water-resistant fabrics, they’re perfect for camping, hiking, weekend trips, and other travels. Most include pockets for small gear organization. Lewis N. Clark’s new collection of packables reconsiders the idea of the classic travel bag to deliver ultimate space efficiency, easy packability, and resistance to the elements.